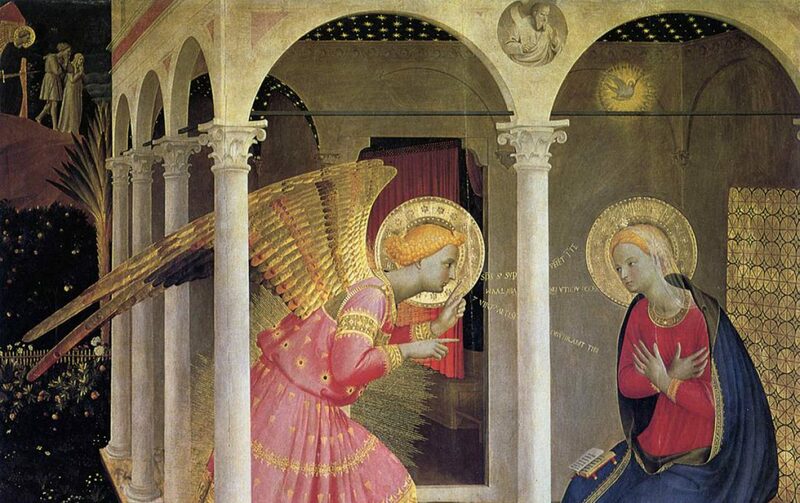 If you are interested in actually creating a sacred image in the tradition of the Roman Catholic (Latin Rite) Church then please click on the Tab in the Menu Bar above Fra Angelico’s image of The Annunciation and read the introductory post on St. Joseph’s Art Workshop. That Tab will explain what I hope to provide interested individuals who would like to participate in this free on-line service. Participants must remember that all artistic endeavors are a continual learning process. As a result, if a student decides to walk through the door of this Workshop they must remember that rarely is a “masterpiece” created by the beginning student on their first try; yet, that student will create a work of sacred art that is personally meaningful to them. Students will read about, study, and actually paint a sacred image by following the steps I provide to them. Our model is St. Joseph, the carpenter. St. Joseph was a master builder and protector of the Holy Family. He was the husband of the Blessed Mother. He was a sturdy man – both physically and mentally. Joseph was of the royal line of King David and as a righteous man knew how to pray to God while he worked in his own workshop. He was a model to the child, teenage, and young adult Jesus, and he is a model for us, too. Our Savior humbled Himself and took human form to successfully redeem all mankind from their sins. We must not forget that prior to His ministry Jesus was also a successful carpenter – having understood and acquired the necessary skills through Joseph’s knowledge and loving care. By working in St. Joseph’s workshop Jesus, at a young age, became aware of the truth that His earthly father was a very holy and humble man who possessed three key qualities of life: prayer, loving service, and obedience to God’s law. We should not forget that painting sacred images demands the same from us. I will discuss this, too, in future posts. I hope that you will seriously consider participating in this on-line workshop. Please click on the Main Menu Tab that says St. Joseph’s Art Workshop to read more about this free educational offer and when it will begin. Copyright © 2011- 2018 Deacon Paul O. Iacono All Rights Reserved.